We have started to post on social media about our “Antique of the Week.” Sometimes we want to highlight a piece of antique furniture or an antique decorative object because it is especially wonderful! It’s a nice way to showcase some pieces that our customers might like to see. We use the hashtag #AntiqueOfTheWeek on our accounts on Pinterest, Facebook and Google+ so if you aren’t following those accounts already, you can search on that #AntiqueOfTheWeek hashtag. We sometimes tie the antique of the week into the season or topical events. 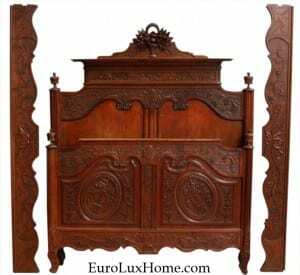 For example, we chose this beautiful romantic French antique bed as our Antique of the Week to honor the royal wedding when Prince Harry married his lovely bride Meghan Markle. Sometimes we choose a piece of antique furniture that has recently arrived on the ship after one of our antique buying trips in Europe, and we have just unwrapped it and are especially delighted to share it with you! 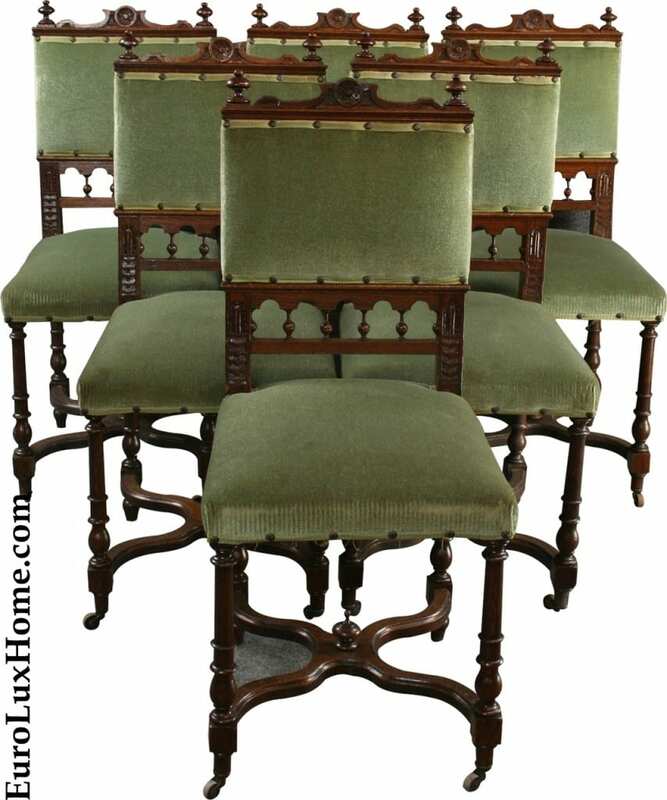 Here are some of favorite Antiques of the Week so far if you missed them! We chose this antique French Renaissance Hunting style settee, because it has just arrived from our last buying trip in France. 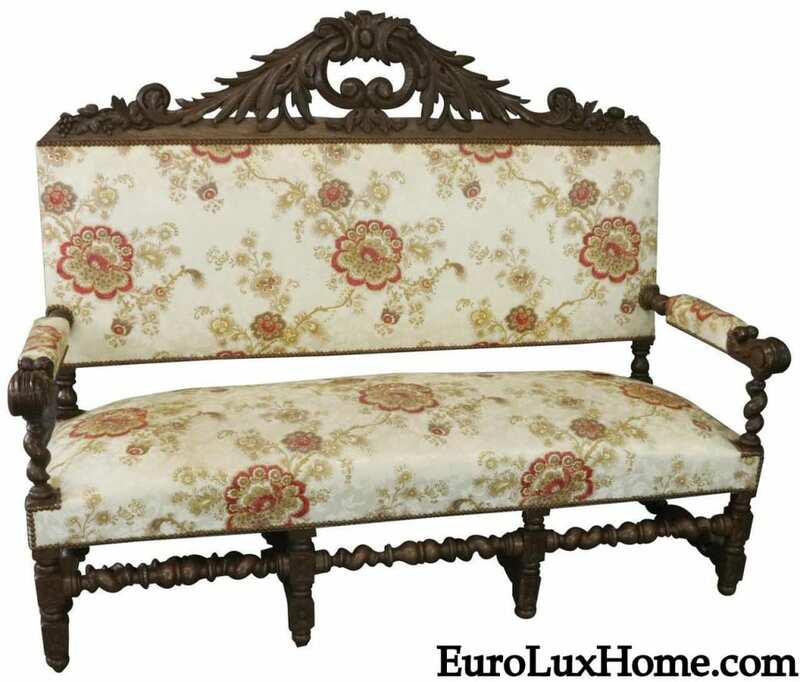 The gorgeous carved flourishes of foliage and floral upholstery also feel so summery. The oak settee dates to 1880 and we also have chairs available to match. Spring also put us in mind of vacation travel, so we chose this antique French trunk with its original iron straps & handles. You will not want to try to check in this heavy oak trunk at the airport, but isn’t it terrific? It was originally made in 1820 for travel and it has iron caps on each corner to protect it on its voyages. 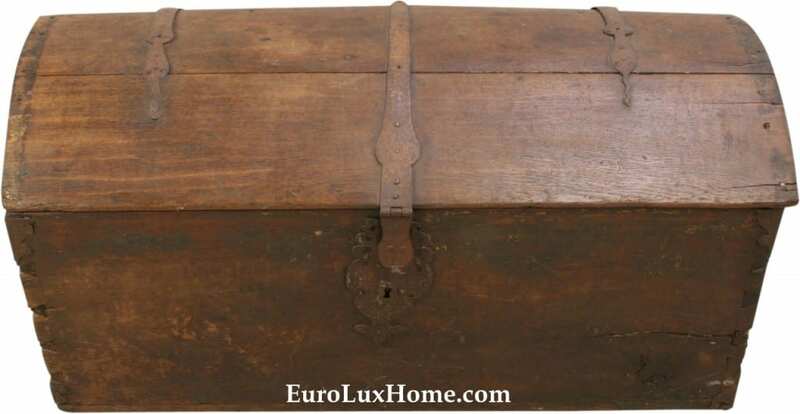 Now it can serve as a rustically decorative storage box and it’s a great conversation point…imagine where this box has traveled since it was first made in France nearly 200 years ago! 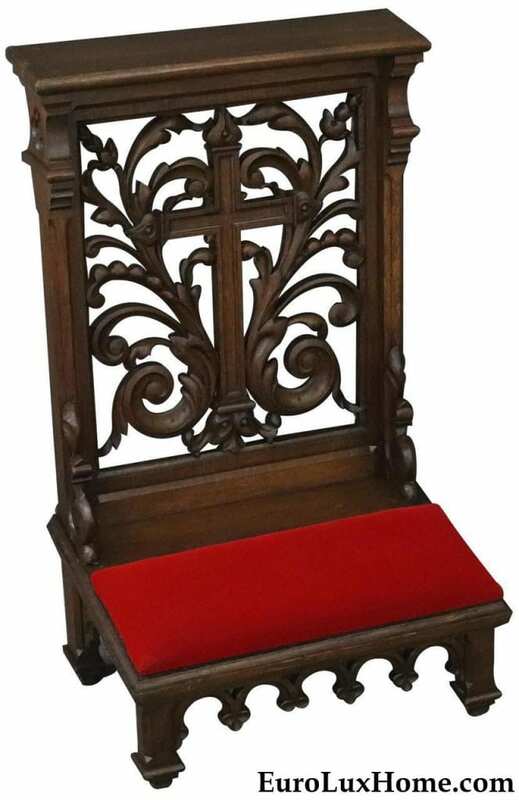 During Holy Week, we chose this beautiful antique French prie-dieu or prayer chair. We found it in a church in Normandy on our recent antiques buying trip to France. It is carved in oak wood, dating to 1890, and we had it reupholstered in red velvet. 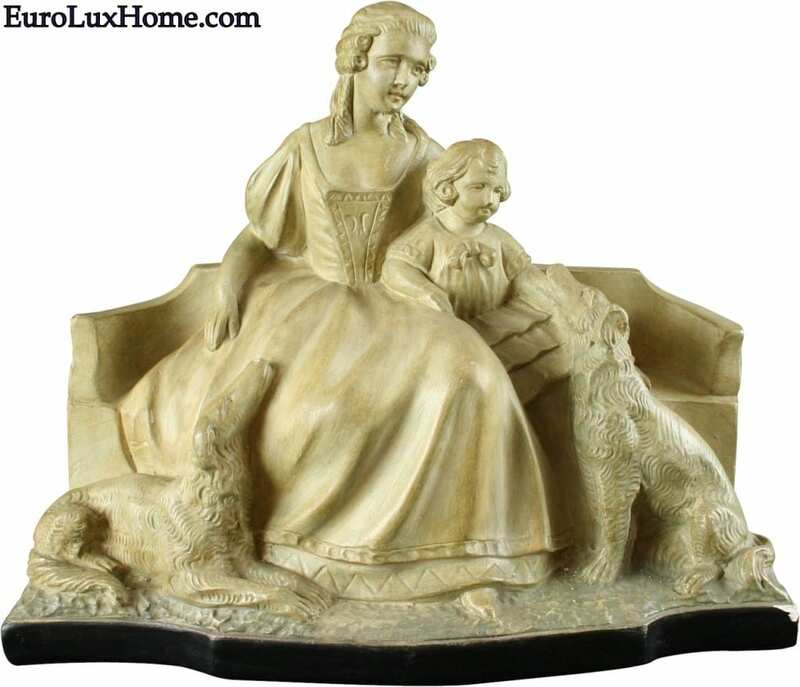 We celebrated moms and Mother’s Day with this beautiful 1930 French chalkware statue showing a precious moment between a tender mother, her child, and the adoring family dogs! The sweet and beautifully detailed statue is a real charmer! This week our Antique of the Week paid tribute to America and American craftsmanship with this antique Eastlake bed, crafted in the USA in around 1890. 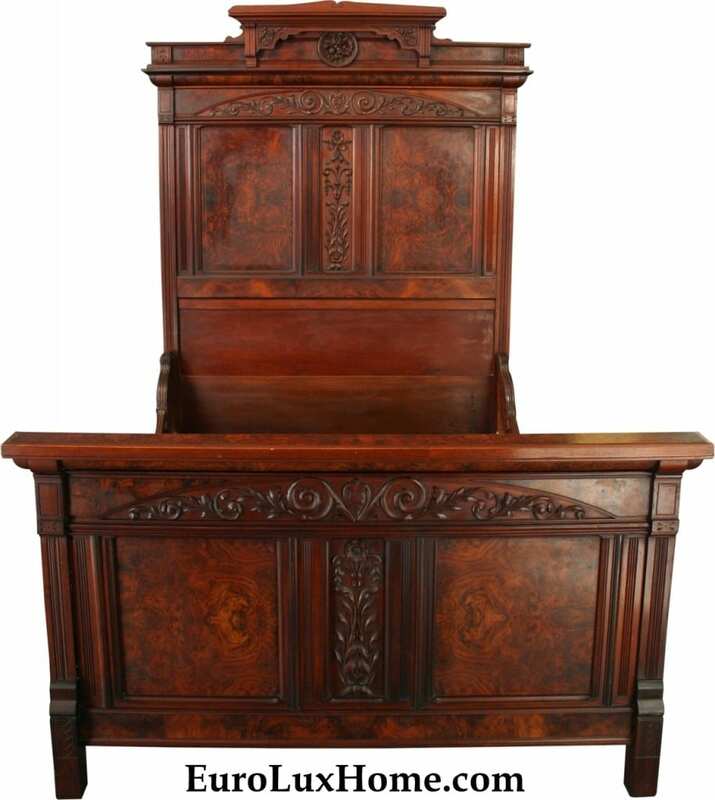 This classic American treasure boasts stately architectural detailing and floral carving in the mahogany wood. If you want to see more of our Antiques of the Week over the coming months, search on the hashtag #AntiqueOfTheWeek and treat yourself to a dose of beauty! This entry was posted in Antique Furniture, News and tagged antique bed, antique ceramics, antique decorative objects, antique French furniture, Antique Furniture, Belgian antique dining chairs, social media on May 25, 2018 by admin.